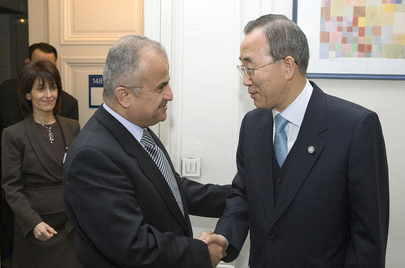 UNITED NATIONS, February 12 -- When UN Secretary General Ban Ki-moon visited Jordan earlier this year, he apparently didn't even speak with Abdel Elah al-Khatib, the Jordanian politician and businessman who had a rocky term as UN envoy to Libya, complete with conflicts of interest, and then quit. On February 9, the day after Ban told the media he had discussed a joint envoy with the Arab League's Nabil Elaraby, Inner City Press asked Ban's spokesman Martin Nesirky when, in fact, Ban last spoke with al-Khatib. Nesirky said he found find out and answer the question, but four days later has not. Al-Khatib never disclosed nor stopped his business activities, which Inner City Press showed included links to a Gaddafi-affiliated bank in Libya, while serving as envoy. He demanded private jets and made UN staff assigned to help him cry, from abuse. Then he was eased out by current UN envoy Ian Martin, and quit -- all this according to well placed sources in the UN Department of Political Affairs, and then unconvincingly denied. This would be the UN - Arab League envoy to Syria? First, Ban or his spokesman should have to answer these questions, including the one for which an answer was promised four days ago. Ban & Khatib before the fall. Now what: member states (of LAS) decided? Inner City Press: one follow-up on this issue of an envoy. The name of Al-Khatib has resurfaced, who was obviously the Envoy to Libya, and so I just wondered when, if you can say — I know that the Secretary-General visited Jordan recently — have there been any contacts with Mr. Al-Khatib, or some people saw it as that, sort of a something of a failed endeavour. Have they… are they still in contact? Does Mr. Al-Khatib have any advisory or other role with the UN, or did that end abruptly and not… did they speak when he was in Jordan, just as one example? Spokesperson Martin Nesirky: I’m not sure which part of the question to answer at this point. Inner City Press: How does it stand between Ban Ki-moon and his previous Envoy to a crisis in Libya? When is the last time they spoke? Spokesperson Nesirky: I’d have to check on that particular point. As for the League of Arab States proposal, as you will have heard me say, this was a proposal from them, and we are waiting to hear more details. Therefore, it doesn’t seem appropriate to put the cart before the horse. But on your particular question about the last interaction, let me find out.